CHIANG MAI, Thailand, May 21 2013 (IPS) - On the outskirts of the northern Thai city of Chiang Mai, a group of twelve migrant families lives in a makeshift camp comprised of houses constructed from scrap metal. They share three toilets between them, and each home consists of nothing more than a single room, whose flimsy walls and roof provide little privacy, and are no match for the heavy monsoon rains that lash northern Thailand between the months of May and November. Sounds of splashing water fill the air as both male and female migrants, returning from a long day’s work, unwind with a shower in the rudimentary, open-air structures that contain nothing more than a rap connected to a water tank. Most of these workers are employed on a residential construction site just north of here, where they pour cement, plaster walls, build roofs or install electrical wiring from seven in the morning until six in the evening, seven days a week. They do not have much to show for these gruelling hours on the job, returning home with as little as six dollars a day. One of this shantytown’s residents, Nang Soi Sat, tells IPS the long working hours and paltry income are not even her biggest concerns: she is more worried about maintaining her legal status in the face of multiple challenges. Thailand is home to an estimated 2.5 million migrant workers. The country’s economic boom – which has seen an 18.9 percent growth in gross domestic product (GDP) since 2011 – relies heavily on a constant influx of labour from neighbouring countries. Over 82 percent of the workers hail from Myanmar (Burma), 8.4 percent from Laos and 9.5 percent from Cambodia. Those from Myanmar say ethnic strife and civil conflict sent them fleeing in search of better opportunities in the region. A network of garment and furniture factories housed in Special Economic Zones (SEZs) that dot the Thai-Myanmar border quickly absorb incoming migrants to work for a pittance. Other key areas of employment for migrants include the seafood and agricultural sectors. For migrants like Sai Sun Lu, the search for better opportunities did not end with his arrival here. Originally from Myanmar’s volatile Shan State, Lu works over nine hours a day at a site in Chiang Mai, constructing high rise buildings that will likely be converted into commercial centres, residential condos or offices, without a single day off. He tells IPS he did not want to come to Thailand, but was forced to as a result of intense fighting in his home. His hopes for greener pastures on the other side of the border have been dashed and he now finds himself living in a kind of daily nightmare, toiling in what rights groups have called “appalling” conditions. According to the U.S. State Department’s report on migration and refugees, Thailand ranks alongside some of the worst offenders of migrants’ rights, including Afghanistan, Chad, Iran and Niger. Because migrant labourers are typically unskilled, with little awareness of occupational safety, they are easy prey for employers looking to cut corners by dismissing safety concerns. 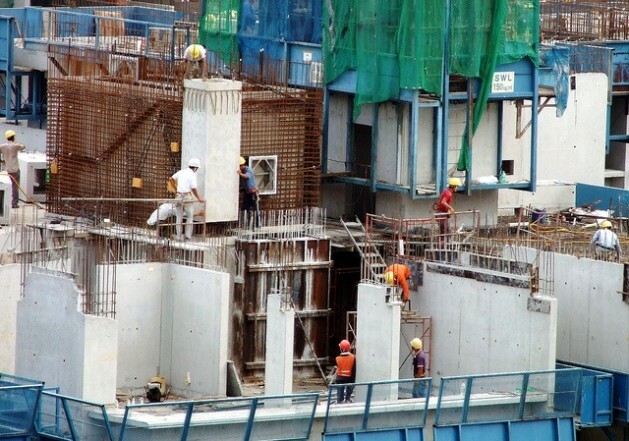 In the construction sector, inadequate training in the proper use of machinery and a lack of protective equipment such as body harnesses or guardrail systems pose a grave threat to those who work on buildings as high as 27 to 69 stories. On Sai Sun Lu’s construction site, “there have been many accidents and deaths. Some workers have slipped and fallen from the high rises but we receive very little or no compensation,” he said. Fear of this last consequence is, for many workers, second only to the fear of death, and a very common one among migrants from Myanmar who account for 75 percent of Thailand’s one million undocumented workers, according to the Institute for Population and Social Research at Mahidol University. The 2008 National Verification Programme (NVP) was intended to legalise the status of incoming migrants and provide them with basic protections under Thai labour laws, such as access to social security schemes, official work accident compensation and the ability to apply for driving licences. However, rights activists contend that the NVP’s registration fees are “extortionate”, often requiring three times the average worker’s monthly salary of between 100 and 167 dollars. According to this year’s World Report, published annually by Human Rights Watch (HRW), Thai employers frequently seize migrant workers’ documents, thus rendering them bonded labourers, while government policies – like the Thai cabinet’s 2010 resolution to fine employees if their papers carry outdated information – impose severe restrictions on migrant workers’ ability to change jobs. Even migrants with all their legal papers in hand often go to pains to avoid encounters with the police for fear of being harassed, physically abused, or arrested. In desperation, many have turned to personal networks of friends and family members to gain access into the country. In rural Myanmar, where most migrants come from, informal transporters linked to smugglers with networks along the border facilitate entry into Thailand. This system has led to the proliferation of so-called recruiters, or agents, who charge exorbitant fees in exchange for providing such services as remitting money, establishing communication channels between families, or securing employment. Following allegations of rampant corruption among recruitment agencies, the Labour Ministry of Myanmar recently banned 12 agencies from sending migrant workers to Thailand, according to an internal memo obtained by ‘The Myanmar Times’. Earlier this month, Myanmar’s Deputy Labour Minister Myint Thein assured labour activists and migrants that the state was doing everything possible to rein in illegal actors and ensure safe, affordable passage between the two countries. It has a vested interest in doing so: a 2010 ILO report found that the average migrant worker in Thailand sent home about 1,000 dollars every month, with total remittances from Thailand accounting for about five percent of Myanmar’s annual GDP.